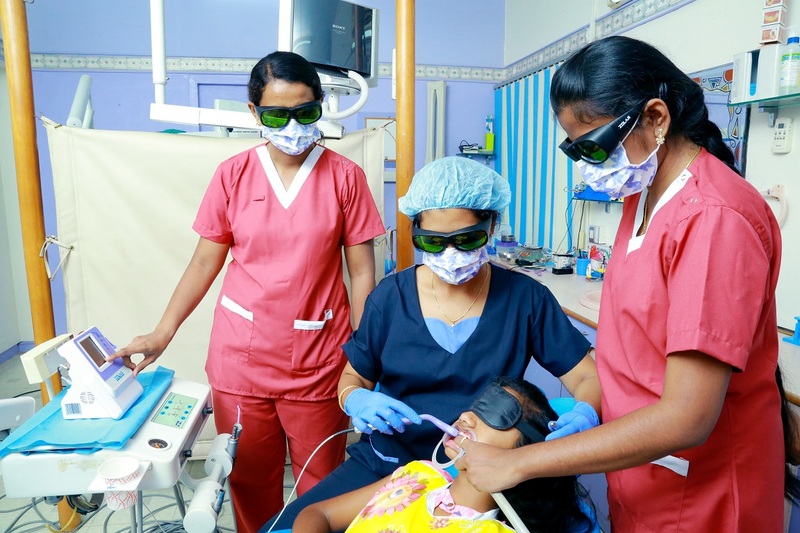 Laser dentistry is kind and gentle. It’s pain free. Laser bleaching: It is painless and tales less than an hour to change dull and yellow colour teeth to sparkling and white colour teeth. Pain therapy : Laser can drastically reduce jaw joints (TMJ) pain in single visit. Ulcer healing : Painful Ulcers becomes painless drastically. Gum contouring : Swollen and irregular gum can be contoured to make your smile beautiful. Gum lightening : Pigmented dark coloured gums can be lightened significantly. Laser surgeries : No cut, No sew (stitches), No fear. Removal of small gum growth. Reduces stress and fear of going to dentist. Fewer dental visits, less time in dental chair. Painless, bloodless, clean surgical field. No or minimal need for anaesthesia. Laser kills bacteria, risk of infection is reduced. No post-operative discomfort and swelling.